As part of an upcoming series of posts on “diy project enclosures” I will describe how to make acrylic / Perspex cement at home with very few elements. 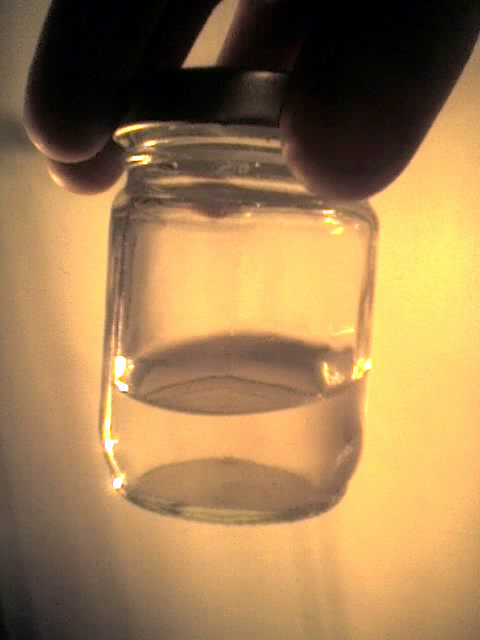 This very same technique may be applied to other similar plastics as well, although in such cases the outcome is almost always a “putty” instead of a proper adhesive. The process is quite simple, all we have to do is place the scraps into the jar, pour some acetone until the acrylic is fully covered and simply close the lid. Stir it every few hours by wiggling the jar, about a day or two after you’ll have a powerful cement for acrylic. You may drink the coffee now! The acrylic bits have to be small, the bigger they are the longer it’s going to take for them to dissolve into the acetone. I reckon if you were to grind the acrylic into a dust, it would work almost instantly — However finding a safe way of doing it may be challenging (Old blender, coffee grinder perhaps?) — The dust may not be very healthy though. Keep the acetone and glue away from children and pets; it is quite flammable and thus inherently dangerous if mishandled. Always store the containers fully closed and away from ignition sources. It’s worth noting that casual exposure to acetone is “a-ok” and it will merely dry your skin. That’s all there is to it, enjoy and be safe!